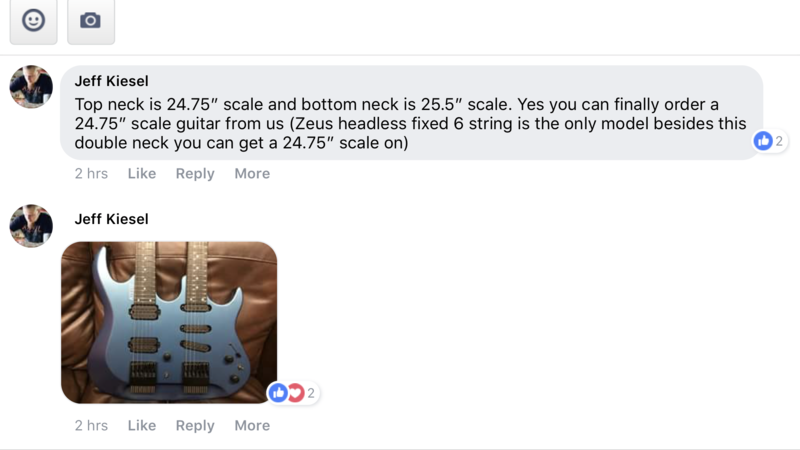 Am i hallucinating, or did jeff just announce a 24 3/4 scale option on the zeus and osiris????? I haven't seen today's live video, but I see people asking about it around 4 minutes in, so if it was mentioned it was likely before that. I watched Jeff say this in the video. No single neck Osiris. Just double neck Osiris or Zeus ((I believe only 6 string for both). Not gonna lie, but it would be devilishly hilarious if it were ONLY available on Zeus double-necks. "You guys all asked for 24.75" scale length, and I gave it to you...and nobody bought it. We sold 2. Just shows there's no demand for 24.75" scale length." I'd love a CS in that scale. Doctor Doug wrote: I'd love a CS in that scale. + 1 million. But on a Zeus only? Really, then, what's the point of even saying its available? I haven't exactly heard the headless crowd clamoring for a short scale. We see this a LOT though...the endorsers drive the product, not the Kiesel-buying GP. Until it makes to other parts of the product line....meh. I've never heard of a 24.75" scale before. What is the benefit of this? I thought 25.5 was the ideal scale unless downtuning in which you want a baritone. Jack'O'Licious wrote: I've never heard of a 24.75" scale before. What is the benefit of this? I thought 25.5 was the ideal scale unless downtuning in which you want a baritone. Sg's, Les Pauls, ES335s, etc and a million other acoustics and electrics are in this scale length, which is sometimes called in shorthand Gibson Scale. Alternately, 25.5 was also called Fender Scale... before the advent of the superstrat and the expanding of the concept of Strats and Teles into such huge business that now probably overshadows Fender. 24.74 is slinkier, easier to bend on, ruder spongier attack, but shorter spacing between frets. All those classic Zep, Cream, so much of Beatles etc are in 24.75. 25.5 is tighter, more difficult to bend, but has wider fret spacing for large hands and has that bloomy attack distinct to all Strats and Teles that make them so distinct. Those classic era Carvin guitars from the eighties were all Gibson scale, Becker's 200's, Friedman's V220, etc etc, all the 150, CM 140, etc. It was only later they went to "compromise scale" 25". + 1 million. But on a Zeus only? Really, then, what's the point of even saying its available? It wasn't announced like a new factory option, for what it's worth. He was talking about what he did for Frank, and then as a passing comment said, "We also have it programmed for the Zeus 6-string, so...if you wanted it...we could do it." It also brings the nut closer to the the player. If you've got shorter arms, 25.5" might feel like 26.5" to someone else who's used to 25.5". Once again. If you had two CS models that were identical but for the scale length — one 25", the other 24.75" — and you could tell the difference between them, then you need to get a job as a water diviner. Or maybe an earthquake forecaster. You will definitely get bruised by a pea under your mattress. Doctor Turn wrote: Those classic era Carvin guitars from the eighties were all Gibson scale, Becker's 200's, Friedman's V220, etc etc, all the 150, CM 140, etc. It was only later they went to "compromise scale" 25". I'm sure you're aware that the true Gibson scale is 24.5625" (making the 25" PRS scale almost exactly up the middle), not 24.75". It's not a huge difference. Interms of sound or bending I can't really feel the difference in scale length between my Gibsons and my CS's. (Hell, I bought 2 CS's at 25"). Where I can tell is the spacing on the first 5 or so frets. Again, not a huge difference but I'd like one in 24.75 still. You're tho thilly when you get mad. Your intonation can tell the difference even if your hands cant. And it tends to be in favour of 25.